Taekwondo Black Belts will find the training in Hapkido to be very compatible with existing skill sets. Joint locks, pressure/nerve attacks, body disruption techniques and ground control tactics provide expert martial artists with more levels of defensive force and help them expand martial arts skills while staying aligned with the Korean based styles. Karate students have also excelled in Hapkido as it compliments the “hard” style with a “soft” option. 100’s have earned black belts in the MHF since 1976 and many schools invite Master Brooks to travel and provide training at their academy. Contact Master Brooks to discuss a seminar at your school! In the last few years we have trained students in Arizona, Florida, Kansas and Nebraska. High ranking black belts like Master Tim Bennett(left) and Mrs. Fleur Goodchild(right) of Kearney, NE enjoy the variety and tactical aspects of MHF seminar based training. 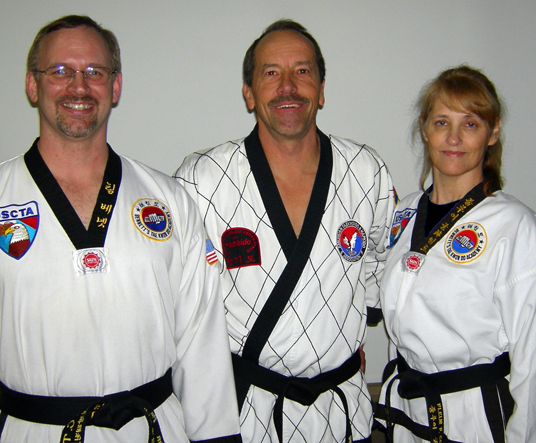 After a year of training with Master Brooks, they recently earned Black Belts in Hapkido from the Midwest Hapkido Federation.